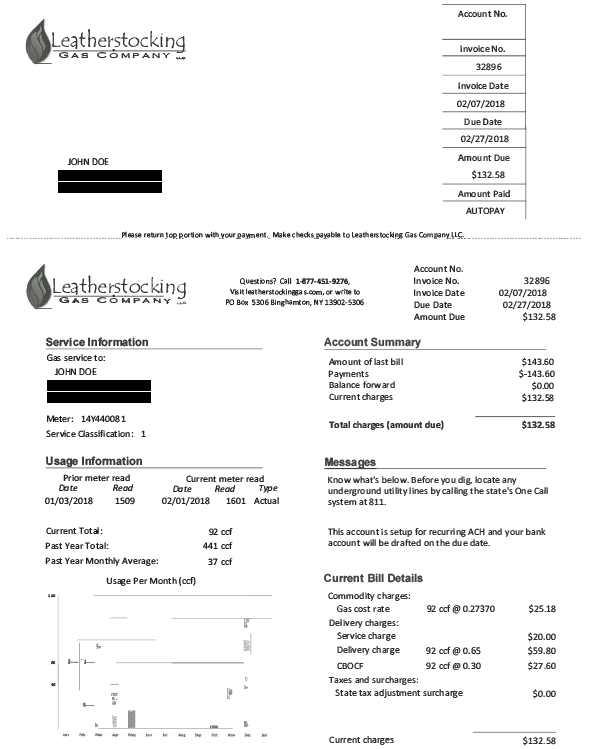 Leatherstocking Gas bills you monthly based on the amount of gas you use. Your usage is billed in volumetric units known as ccf, or hundred cubic feet. Below is an explanation of the four charges that will be on your bill. Your usage will vary based on weather, insulation, thermostat setting, number of appliances that use gas, and more. The cost to generate invoices and other operational costs. $0.27373 per ccf for the gas itself. We do not make money on the sale of the gas. What you pay for it is what we pay for it. This cost will change periodically but is relatively stable. $0.65 per ccf for the cost to transport the gas from the wellhead to LGC’s gate station. (Construction Build Out CIAC Fee) – $0.30 per ccf for the first 10 years in a municipality to cover the cost of building out the LGC infrastructure.